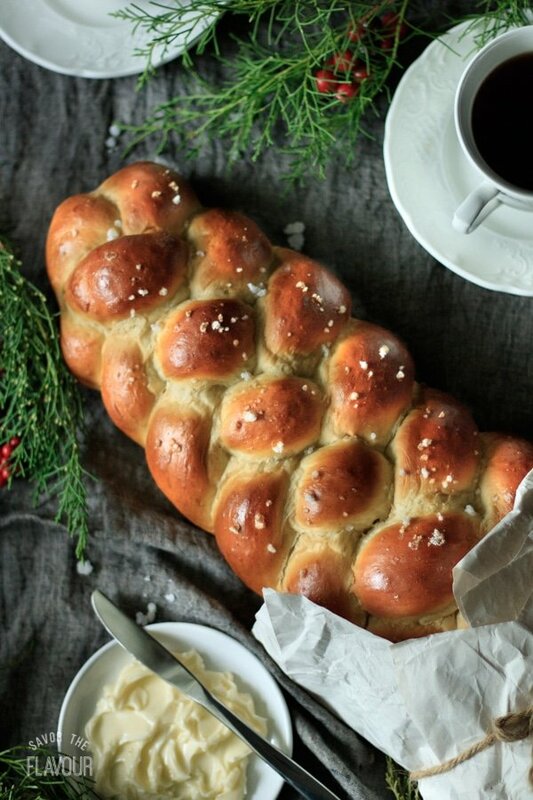 Enjoy a piece of this soft and fluffy Finnish cardamom bread with a cup of steaming coffee. A traditional braided loaf, this brioche-type dough is sprinkled with pearl sugar and baked until golden. 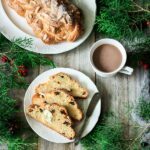 It would make a beautiful Christmas morning breakfast or afternoon snack! For several years now, we’ve had a recipe for Pulla, or Finnish cardamom bread, sitting in our cupboard. One of my Canadian relatives gave it to us a few years ago, but I hadn’t made it until recently because I wanted to improve my breadmaking skills. I’ve slightly changed the original recipe, and I think it’s a keeper for sure! 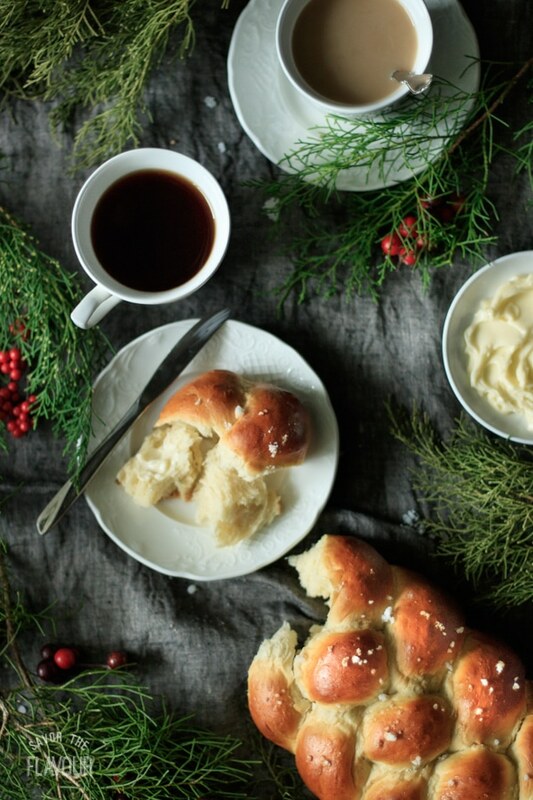 Pulla is a popular Finnish bread often served with coffee or tea. It’s basically a light brioche dough that tastes fantastic plain or with butter. It makes a wonderful afternoon snack with a cup of tea, since it’s so fluffy and yummy. You might just want two or three slices! Be sure to use bread flour and not all-purpose flour when making yeast breads. The additional gluten in bread flour gives the bread strength to rise higher and makes it more chewy. All-purpose flour will not give you the same results. Save time and effort by using fast-action yeast instead of active dry. Active dry yeast must be dissolved in warm water and sugar and let stand until foamy before you can add it to the bread dough, slowing down the process. Fast-action doesn’t require this step. Help the dough rise more quickly by placing it in a steamy oven. This is a handy tip, especially during the cold winter months. Place the bowl of dough on the middle rack of a cold oven, and put a pan of boiling water on the rack below the dough. Keep the oven door shut to trap the warm steam in the oven. Don’t pull on and stretch out the strands of dough when you’re braiding the loaf. This will make the loaf skinnier at one end than the other. Place an extra cookie sheet under the loaf while it’s baking. The air trapped between the two cookie sheets insulates the bottom, keeping it from browning too quickly. Use a meat thermometer to check when your bread is done baking. The loaf should be a rich golden brown and have an internal temperature of 190 F.
Let the bread cool completely before serving. Freshly baked bread is full of steam, and needs time for the inside to cool down and harden. Cutting it too soon means a gummy, doughy bread. Freeze leftover bread in slices. Your family will love it plain or toasted! Satisfy your sweet tooth with these other sweet breads. 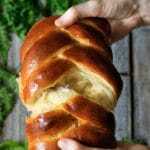 Challah Bread: a gloriously fluffy Jewish bread perfect for Easter, Sabbath, or any occasion. 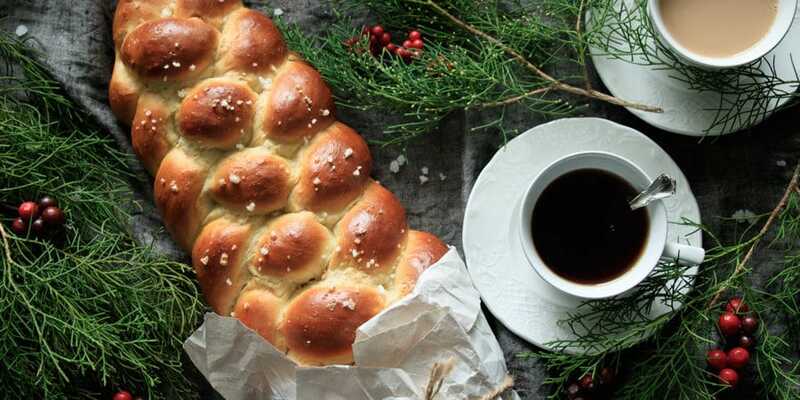 Vánočka: this Czech Christmas bread is a beautiful braided loaf with a flaky texture. Kanellängd: a light and fluffy Swedish cinnamon bread topped with orange zest and icing. 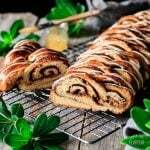 Did you make this pulla recipe? Please leave a star rating below the recipe to share how you enjoyed it. Put the milk and butter in a small saucepan and stir over medium heat until the butter has melted and the mixture reaches 115 F. Remove from the heat. Crack the eggs into a bowl and add the milk mixture, sugar, cardamom, salt, and yeast. Stir well to combine. Gradually stir in the flour until the dough becomes too stiff to stir. Continue to add more flour and mix with your hands until a soft, somewhat sticky dough has formed. Knead the dough briefly in the bowl, then turn it out onto a floured surface and knead for 10-15 minutes until the dough is no longer so sticky and is smooth and elastic. Shape the dough into a ball, place in a lightly buttered bowl, and cover tightly with plastic wrap and set aside to prove until doubled in size, about 1 1/2 to 2 hours. Line a large, light-colored metal cookie sheet with parchment paper. Knock back the dough by punching it down all over, then divide it into 4 equal pieces, using a kitchen scale for accuracy. Each piece should weigh approximately 226 grams. For each piece, punch it down into a rough rectangle, then roll it up and pinch the seam to seal. Roll the log to a 2 foot long rope. If the dough isn’t rolling easily, let it rest for a few minutes, then come back to it. Place the four strands side by side and join them together at the top. Stick them to the work surface by pressing down firmly with your thumb. Plait the dough in a four-strand braid. Think of the strands of being numbered from 1 to 4, from left to right. Bring 4 over 3, then bring 2 over 1. Cross the new strand 2 over strand 3. Repeat this sequence until the whole loaf is plaited. Tuck the ends of the plait underneath the loaf and transfer it to the prepared cookie sheet. Place the tray inside a large, clean garbage bag and tuck the ends underneath the tray to seal. Let the loaf prove for about 30 minutes, until the dough springs back quickly when gently prodded with a fingertip. About 10 minutes before the dough has finished proving, preheat the oven to 375 F.
Brush the loaf with the lightly beaten egg white and sprinkle with pearl sugar. Bake at 375 F for 10 minutes, then lower the temperature to 360 F and bake for another 10 minutes. Lower the temperature again to 300 F and bake for another 3-5 minutes. To check if the loaf is done, take its internal temperature with a meat thermometer. It should be at least 190 F, but less than 200 F. The loaf also should be a rich golden brown on the top and bottom. Let the bread cool completely on a wire rack before eating. Don’t use very much flour when rolling the dough into ropes, or it will be impossible to roll them out. If you don’t have pearl sugar in your pantry, just place 3/4 cup of granulated sugar in a large skillet. Add 1 tablespoon of water and stir until the sugar forms medium-small clumps. Add water 1/4 teaspoon at a time if not all the sugar clumped. Set the pan over very low heat and stir frequently until the sugar clumps have dried out and you can pick them up easily with a spoon. They will continue to harden as they cool.